The student section at Flames basketball games has a new identity: The Fire Pit. The Fire-Pit-student section has brought renewed life the Vines. And it’s all thanks to a pair of Liberty sport management students and a Twitter page. The students, junior Jordan Elliott and senior Austin Needels, originally met in their sport management classes together. Elliott hopes to become a college athletics director, while Needels aims to go to the police academy after graduation and become a Lynchburg police officer. Between classes and a shared love and passion for sports, the two became friends. Elliott and Needels decided it was time for a change when they went to a Flames basketball game and saw a lackluster student involvement. Thus, the Fire Pit Twitter page (@LUFIREPIT) was born. The page, originally Elliott’s idea, shared its first tweet Dec. 3. The Fire Pit took off after that, adding around 200 followers within a month of its creation. ENGAGING— The Fire Pit is run by two sport management majors, Jordan Elliott and Austin Needels. According to Elliott, the page was started to show support for the team. And their effort has made a difference. The Fire Pit teamed up with the Liberty Student Government Association to host a Red Out night and pre-game car smash, both of which were huge successes. The Vines Center was glowing hot with red T-shirts and louder than ever when the Flames routed NJIT 77-57 Saturday, Feb. 2. Aside from organized color nights and events, the student section has been much louder and more active. Jerry’s Jokers and the Fire Pit have worked together to make signs and create new cheers. 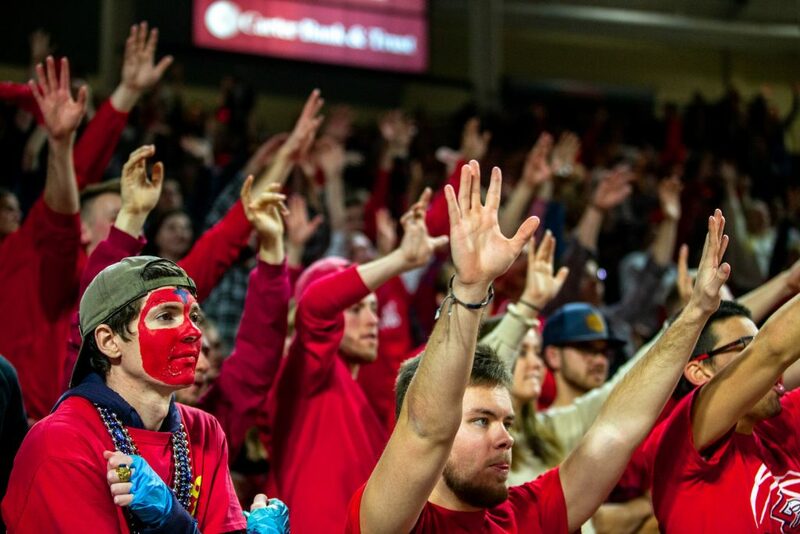 Between creating a distracting free throw racket, chanting for the Flames when they are on defense or calling a false shot clock countdown, the students have brought new life to Flames basketball games. CHEER — The Fire Pit partnered with the SGA to organize a red-out game and promotes other game events. For now, the Fire Pit is a basketball-exclusive page. The Twitter page regularly retweets and shares tweets from the men’s basketball twitter (@LibertyMBB) and others, including Did Liberty Win? (@didlibertywin) and A Sea of Red (@ASeaOfRed). However, both Needels and Elliott said that an all-sports student section is not out of the question. Follow the Fire Pit Twitter page for updates and game information at @LUFIREPIT. 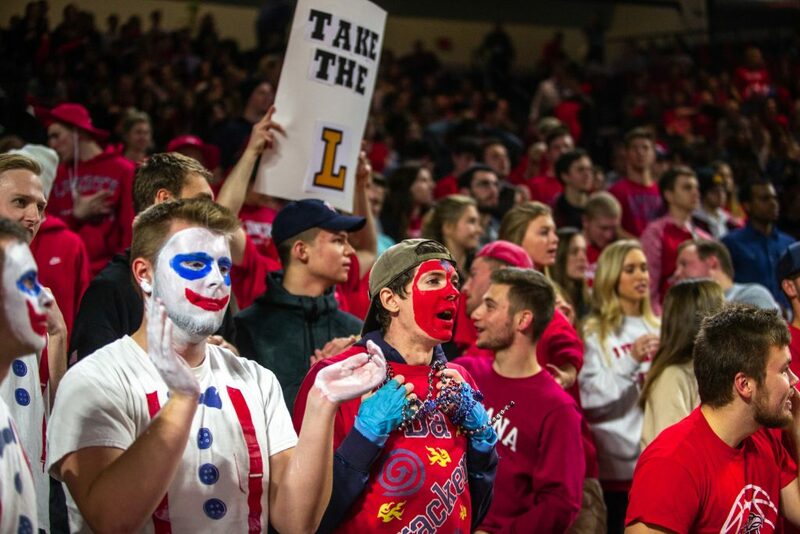 The Fire Pit student section will be out in full force for the last home game of the regular season when the Flames host Kennesaw State Tuesday, Feb. 26. The Flames will be celebrating senior night, honoring graduating seniors Lovell Cabbil Jr., Keenan Gumbs and Zach Farquhar.